Managing your upfit inventory is a little more challenging than managing the normal vehicle inventory. The retail systems, for the most part, see your upfit vehicles as chassis cabs or cutaways, when in reality they maybe be a service truck or dump truck, or, … . Our inventory sees your trucks as what they are, which can provide valuable information that is currently unavailable to you and your GM. This is an example of our vehicle aging report. Its initial sort has the vehicles oldest to newest, but other sort options are available by clicking on the column title. We offer a service that daily will alert you, by email, of any vehicles reaching 270, 180 and 120 days in inventory. This report values your inventory. The initial sort is by stock number. Other sort options are available by clicking some of the column titles. 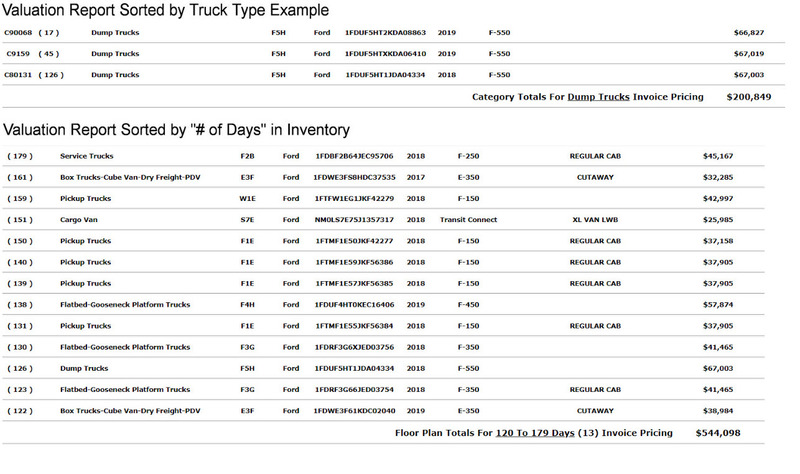 For instance, the top report was sorted by Category and shows all 3 Dump Trucks in the inventory and total value of those three trucks. Another example is the lower report that was sorted oldest to newest. This report also subtotal valuation for the following date ranges: vehicles between 0 and 119 days, 120 and 179 days, 180 and 269 days, 270 and 359 days and over 360 days. The example is from 120 to 179 days in inventory. The pricing portal allows you to change the MSRP, Selling Price and Specials Price. The Sell Price can be the price entered, or can be a price-plus Sell Price. Some dealers enter their invoice price in the “Sell Price” field and the system will automatically add a set amount, say $300, to that price automatically. We also offer a Special Price. Unlike the Sell Price, the Special Price has a Thru date. When this date is reached the price reverts back to the regular pricing. The Special Price and the Thru Data is shown in the inventory in red. The price history section is part of the Pricing Portal and has two main uses. 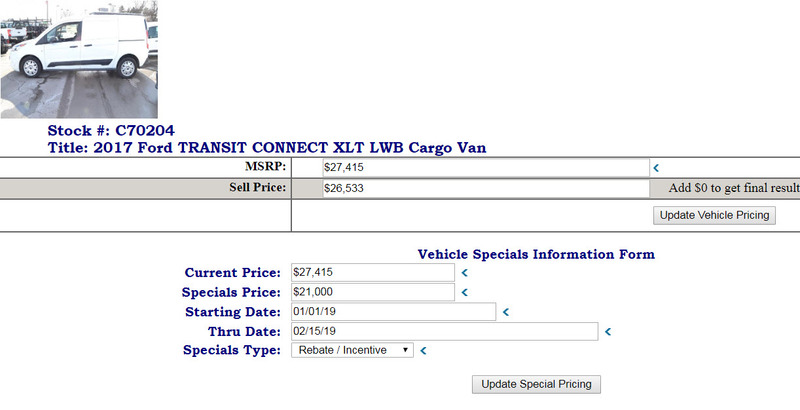 First it lets you know how the vehicle has been priced while part of the active inventory. Secondly it can show your GM what you have done to create interest in the vehicle. In reality, besides advertising, the only way you have of stimulating interest in a vehicle that is by price.